This page provides answers to the most frequently asked questions - everything, from ordering process to guarantee, is chronologically listed. Just click on the respective link to get detailed information. However, if you cannot find an answer, don‘t hesitate to contact us, we are happy to assist you. And now: Have fun reading! There is nothing that is more fun than shopping! On our website, you can browse through our items for as long as you desire and put them in your shopping cart without obligation. After choosing the first item, your shopping cart becomes visible on the right side of your browser. In order to end your shopping tour and to purchase your chosen items, just click on "proceed to checkout". There you will be shown all your chosen items, which you have previously put in your shopping cart. You can also change the number of items or delete single or all items from your shopping cart. After clicking on 'checkout' - the button on the right side of your browser -, you will be directed to your 'Warenkorb (shopping cart)'. Above the shopping cart, the 'Time bar' always shows you which step of the ordering process (Warenkorb (shopping cart) - Adresse angeben (shipping information) - Bezahlen (payment) - Bestätigen (place order)) you are currently taking. All items that you have chosen from the shop are displayed in your shopping cart. You can still change the number of items or delete single or all items from your shopping cart. If everything is to your satisfaction, click on 'Nächster Schritt (next step)' to proceed. When you reach 'Adresse angeben (shipping information)', please provide your name, address (billing address, if necessary differing delivery address - just check the box 'Andere Lieferadresse (differing delivery address)' in the upper right corner), phone number and your e-mail address, and click on 'Nächster Schritt (next step)'. If you don‘t have an e-mail address, please ask a friend or family member whether you can use theirs for this order. When you reach 'Bezahlen (payment)', please choose your preferred payment option. If you choose PayPal and click on 'Nächster Schritt (next step)', you will automatically be directed to PayPal and asked to log into your PayPal account, or to pay by debit or credit card. Afterward, you are automatically redirected to your ordering process on our website. When you reach 'Bestätigen (place order)', you will receive another overview on your order and your information. In case you have mistyped something, you can correct it at this point before checking the box 'Ich habe die AGB und Rückgabebelehrung gelesen und akzeptiert (I have read and agree to the general terms and conditions, as well as the return policy)' and then placing your order by clicking on 'Zahlungspflichtig bestellen (complete order)'. In the following, you will receive an acknowledgment of receipt with all the information on the order, our account information (important for prepayment), the statutory cancellation policy, and our general terms and conditions from us, which will be sent to the e-mail address of the invoice recipient provided by you. 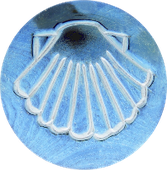 We offer four payment options in our shop. If you pay via credit card or PayPal, the order processing will be faster since we will only process your order after receiving payment if you choose prepayment. When paying with credit card, please provide your credit card number, the check digits (the 3-digit number on the back of your credit card), the full name of the card holder, and the expiration date of the card (on the front of the card after "Good thru"), and you are done. Of course, your credit card information is transmitted encrypted. PayPal is an online payment service (which is free for buyers) that makes it possible for you to pay securely, easily and quickly in online shops. 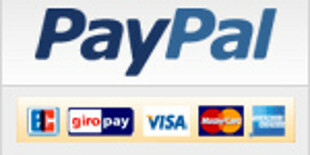 In order to use PayPal, you need a PayPal account, where you register with your bank or credit card account. This way, you do not have to provide this information each time you buy something online. You can then pay with PayPal using your e-mail address and your password. Your PayPal account is directly charged with the respective amount and you receive an order confirmation at your provided e-mail address. For more information, please check 'www.paypal.com'. After clicking on 'Zahlungspflichtig bestellen (complete order)', you will receive an acknowledgment of receipt of your order with our account information via e-mail. Please transfer the due amount to our account within 7 working days. As a purpose, please state the full name of the stated invoice recipient so that we can assign your transfer accordingly. After receiving the amount on our account, we will send you an e-mail concerning the state of your order, and send your goods on the way. In order to prevent disagreements, please only pay after receiving the order confirmation. After clicking on 'Zahlungspflichtig bestellen (complete order)', you will receive an acknowledgment of receipt via e-mail. In the following, we will ship the goods and the invoice to the delivery address stated by you, or send the invoice to a different invoice address if necessary. Please transfer the invoice amount (after receiving the goods and the invoice) within 7 working days to our account. As a purpose, please state the full name of the stated invoice recipient so that we can assign your transfer accordingly. Shipping costs are automatically calculated and displayed during the order process in our online shop. Generally, we ship our goods within 1 - 4 working days with DHL. The delivery time in Germany after shipment is about 2 days. The international delivery time depends on the respective country and can take up to 3 weeks. Within Europe delivery time is generally 4 - 8 days. Shipping costs within Germany range from 0.00 € up to maximum 4.95 € per order. If your order amount is 50.00 € or more, shipping is free. International shipping costs are 6.95 € per order. If you want to withdraw from the contract please just contact us. You have the right to withdraw from this contract without reasons within four weeks. The revocation period is fourteen days from the day which you or a third party other than the carrier and indicated by the consumer acquires the goods. via a clear statement (e.g. with a letter via mail, fax or e-mail) of your decision to withdraw from this contract. Therefore, you can use the attached standard cancellation form but this is not mandatory. You can also fill in and send the standard cancellation form or any other clear statement on our website www.jakobsweg-bewahrer.de electronically. If you do so, we will immediately (e.g. via e-mail) send you a confirmation about receiving your cancellation. Timely dispatch of withdrawal shall suffice to meet the revocation period. If you withdraw from this contract, we are to reimburse you all payments we have received from you, including shipping costs (except for additional costs due to your choosing of a different delivery way than our offered, cheap standard delivery), immediately and latest within fourteen days from the day of receiving your statement of withdrawal from this contract. For the reimbursement, we will use the same payment method that you have chosen for the initial transaction, unless you explicitly arrange a different method; not in any case will you be charged a fee for this reimbursement. We are allowed to refuse reimbursement until we have received the goods or until you have provided evidence of returning the goods, depending on which is the earliest date. You are to return the goods to us immediately and in any case within fourteen days at the latest from the day you have informed us about your withdrawal. Timely dispatch of the goods (within fourteen days) shall suffice to meet the revocation period. You will bear the direct costs of the return shipment of the goods. You only have to compensate for a possible loss in value if this loss is, by examination of the quality, properties and functionality of the good, traced to unnecessary handling by you. The timely dispatch of the goods or of the rescission is enough to preserve this deadline. In case of an effective cancellation the mutually received benefits are to be returned. If you've already made payments we will refund you the purchase price. If you can't return the whole benefits or only parts of it or only in deteriorated condition you have to afford us compensation for the value. Among other things you can avoid the obligation to pay compensation if you don't tread the goods as if they are your own property and leave everything which impairs their value. If you are not satisfied with one of our products or if we have delivered the wrong product, please contact us. The guarantee period is two years from delivery of the goods. If the delivered goods show apparent defects or transport damage, please contact us immediately but within one week after delivery of the goods at the latest. The guarantee does not include defects due to natural wear, wear and tear through usage, or improper use.